Pueblo SacBe is a conscious community growing in the jungle between Mother Earth and the Caribbean sea. Our collective dream is to create community in a safe and respectful environment, encouraging awareness of our globe and harmony in our lives. Our focus is on creating an intentional village that functions within the laws of nature and becomes sustainable with the ingenuity of the villagers and the abundant local resources. The SacBe Team is committed to the project and our goal is to draw like minded people to share this tapestry of dreams. Pueblo Sacbe has an area of 54.25 hectares (134 acres) and is owned and managed by SacBe Village S.A. de C.V. a Mexican Corporation comprised of six directors and several international advisers. The property is registered in the land Registry and each lot is fully titled. Our project is approved for residential and commercial land use with a density of 13.5 homes per hectare, and the government is favorable to our environmental concepts. The project is located eight kilometers northwest of the center of Playa del Carmen, Quintana Roo, Mexico, and five kilometers west of the white sand beaches of the Caribbean Sea. Much more than a gated development, Pueblo SacBe is a private oasis located in the jungle within the city limits of Playa del Carmen, Mexico, the fastest growing city in North America. We have sold lots over the past years to people from Mexico, Germany, England, Italy, Belgium, Brazil, Canada, USA, Lithuania, Russia, Singapore, Columbia, Peru, Sweden, Norway, Spain, and Holland, and many are actively building the home of their dreams here in the Riviera Maya. 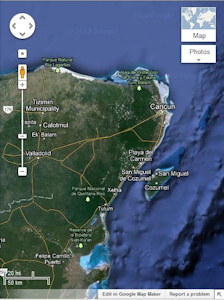 For more information about the Playa del Carmen area, visit Playa.Info. PARKS AND OUTDOOR SPORTS - Several hectares have been set aside for trails and park areas, including an outdoor sports area offering volleyball. There are several large caverns with cenotes integrated within parks for the residents and guests to enjoy. AMPHITHEATER - For those wishing daytime and evening entertainment, a beautiful natural outdoor amphitheater has been created above the Tohoku cenote as a home and forum for music and theater groups. HEALTH RETREAT - Planned on a 3 acre site. Services specializing in alternative therapies, including traditional Mayan and Mexican methods, will be offered. RESEARCH AND ORIENTATION FACILITY - Because of the abundance of flora and fauna and the wealth of history in the area, a research and orientation facility is planned on the property, inviting university and archeological groups to study local finds, biofilia, and understand the beauty and importance of our special ecosystem while celebrating Mayan culture. COMMERCIAL OPPORTUNITIES - Commercial areas have been designated for restaurants, coffee houses, wireless internet, galleries, convenience stores selling environmental products, daycare, and a laundry service. Residental lots over 1,250 meters can also be developed with bed and breakfast accomodations. All contents of this website Copyright © 2012 SACBE VILLAGE, S.A. de C.V. All Rights Reserved.